Flint Hills Masterworks Chorale is a community choir sponsored by Manhattan Christian College. The choir consists of 60-80 singers of all abilities, from the beginner to the professional and from teenager to senior citizen. They are all united in their love of singing the classics. A concert is presented at the end of each academic semester. These programs are presented locally and are accompanied by organ, piano, and other instruments. Flint Hills Masterworks Chorale was founded in the fall of 1994 by Ruth Robertson, a voice teacher in the Music Department at Manhattan Christian College. By the end of her first year conducting the chorus, Ruth had finished her doctorate, and she moved away from Manhattan to take a university teaching position. The choir was then directed for a year by Cherié Caulley, a local church choir director, who was succeeded in turn by MCC faculty member RubyAnn Poulson, also for a year. In 1997 RubyAnn handed the baton to a young British musician who was a graduate of the University of Kansas, and who remained in the United States to teach at MCC. Dr. Ian Coleman conducted the choir for five years. Dr. Reginald Pittman from Kansas State University directed the chorale 2002-2014, taking the group on tours to Europe in 2009 and 2012. Dr. Julie Yu, Co-Director of Choral Studies at Kansas State, was our director 2014-2018. Our current director is Dr. Jeffrey Ward, Director of the School of Music, Theatre, and Dance at Kansas State University. Mary Ann Buhler has accompanied the choir throughout its history. She earned her Master of Library Science (MLS) degree from Emporia State University and a Bachelor of Music in Piano Performance from Kansas State University. In addition to being the accompanist and coordinator for the Flint Hills Masterworks Chorale, she is organist at College Avenue United Methodist Church and Director of Library Services at Manhattan Christian College. 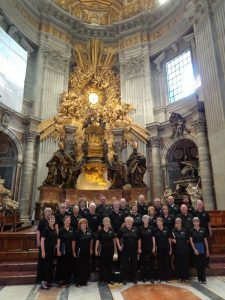 In June 2012 the Flint Hills Masterworks Chorale traveled to Europe to sing in Italian cathedrals. First stop was Venice, where they sang in a Saturday evening mass at St. Mark’s Basilica. In Florence they participated in a Sunday evening mass at St. Mark’s Cathedral. After touring San Gimignano and Perugia, the chorale traveled to Assisi and presented a concert in the Papal Basilica of St. Francis of Assisi.Visiting all the famous sights of Rome was fascinating, but the highlight of the entire trip came on the last day, when the chorale performed in the Sunday noon mass at the main altar (Altar of the Chair of St. Peter) in St. Peter’s Basilica in Rome. What an awesome experience to sing in one of the premier churches in the world! The chorale’s first tour occurred in June 2009. They flew to Budapest, Hungary where they sang in an evening mass, then joined forces with a local choir for a concert. In Vienna, Austria they performed at St. Stephen’s Cathedral before singing at Schönbrunn Palace. On Sunday they sang in the morning mass at the Dr. Karl Lueger Memorial Church in the Central Cemetery. That is the cemetery where Gluck, Beethoven, Schubert, Hugo Wolf, Johann Strauss Father and Son, and Brahms are buried, just a short ways from the church. After Vienna the chorale sang concerts at the Melk Abbey, the Salzburg Cathedral, and the Museum of Music in Prague, the Czech Republic. The final concert was held in the town of Karlík, a neighboring town of Dobřichovice, which is Manhattan’s Partner City. Dr. Jeffrey Ward is the Director of the School of Music, Theatre, and Dance at Kansas State University, where he oversees a comprehensive performing arts program with over 500 majors and minors and more than 4,000 students participating in programs across the School. 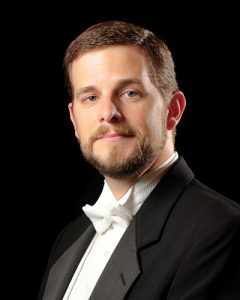 He received his Doctor of Musical Arts degree in Music Education (Conducting) from Shenandoah Conservatory in Winchester, VA; his Master of Music degree in choral conducting from East Carolina University in Greenville, NC; and his undergraduate degree in music education from Rollins College in Winter Park, FL. Prior to his appointment at Kansas State, Dr. Ward served as Associate Dean for Assessment in the College of Fine Arts and Communication, and Associate Director and Associate Professor in the School of Music at East Carolina University. As a conductor, Dr. Ward has conducted the East Carolina University St. Cecilia Singers and University Chorale; the Greenville Choral Society; and the Norfolk, VA Cantata Chorus. 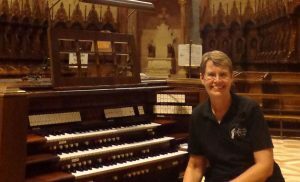 Additionally, he served as Director of Traditional Music at St. James United Methodist Church in Greenville and Director of Music Ministries at Monumental United Methodist Church in Portsmouth, VA. Dr. Ward has appeared as a guest conductor with school, community, and church choirs in Florida, Kansas, North Carolina, and Virginia. 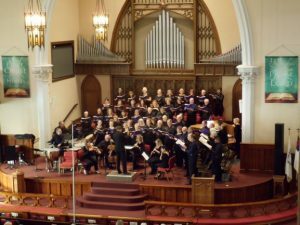 The Spring Concert for the Flint Hills Masterworks Chorale will be an all-Mozart concert with the First United Methodist Church Orchestra. The Chorale will perform include Te Deum, K.141; Vesperae Solennes, K.339; Regina Coeli, K.276; and Mass in C, K.317 (“Coronation”). Held at First United Methodist Church, 612 Poyntz Avenue, the concert will be on May 8 at 7:30 p.m. Admission is free, but donations will be accepted at the door to offset the cost of the performance. Flint Hills Masterworks Chorale is a community choir and is open to all area singers interested in joining. The choir rehearses 7:00-9:00 p.m. every Tuesday during the school year at First Lutheran Church at 10th and Poyntz Avenue. At least two performances are held locally every year. The registration fee for each semester is $10.00, and there is a charge to purchase music. To find out more about the choir, come to a rehearsal in the Fellowship Hall at First Lutheran Church (enter by the north door), or contact Mary Ann Buhler mabuhler@mccks.edu.